For the third year, I look back at my last twelve months of images and growth as a photographer. These may not be my absolute best images, but they are some of my favorite. Glancing at my 2014 and 2015 best photographs posts, I feel like I’ve improved a lot as a photographer, especially in my ability to find more interesting images even when I’m not looking for something specific or feeling particularly inspired. 2016 began for me on rather a photographic high. I’d had a great summer and fall in 2015 and was still feeling inspired despite the weather. Snow lingered late into spring in Colorado, and rain fell day after day until midsummer. Some of the warmest days of the year were well into autumn. 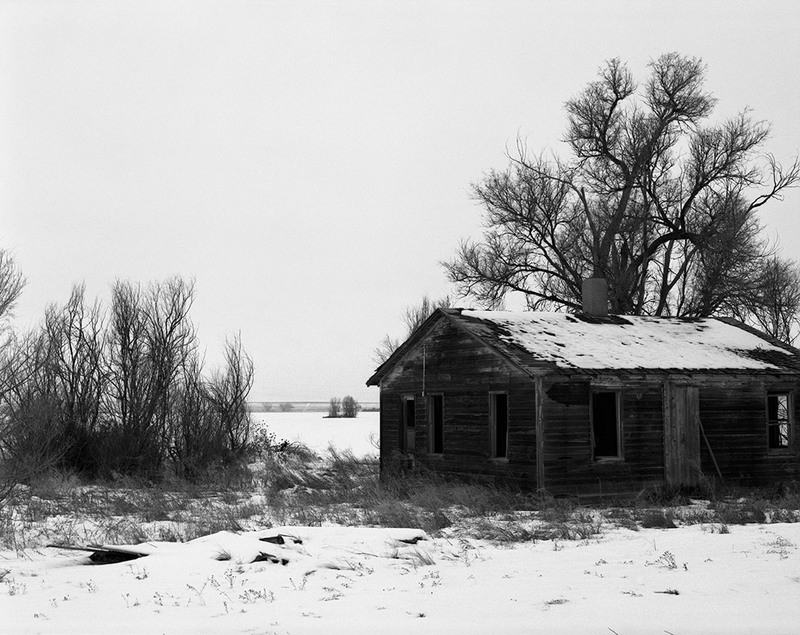 Early in the year, Craig and I met up in northeastern Colorado to make some pictures of a near-ghost town called Hoyt. Though the Pentax decided to be troublesome, I managed a few rolls with it before switching to my backup — the Yashica-Mat. Of course, what I thought was all weather-related turned out to be an entirely different problem with the Pentax that, once I learned how to solve it, turns out to be no big deal. Among the abandoned houses in Hoyt was one that appeared likely to have been occupied until not that long ago, but which had some damage to the upper story — it appeared to have had portions of the wall sawn out — that had let the weather inside and caused very rapid deterioration. 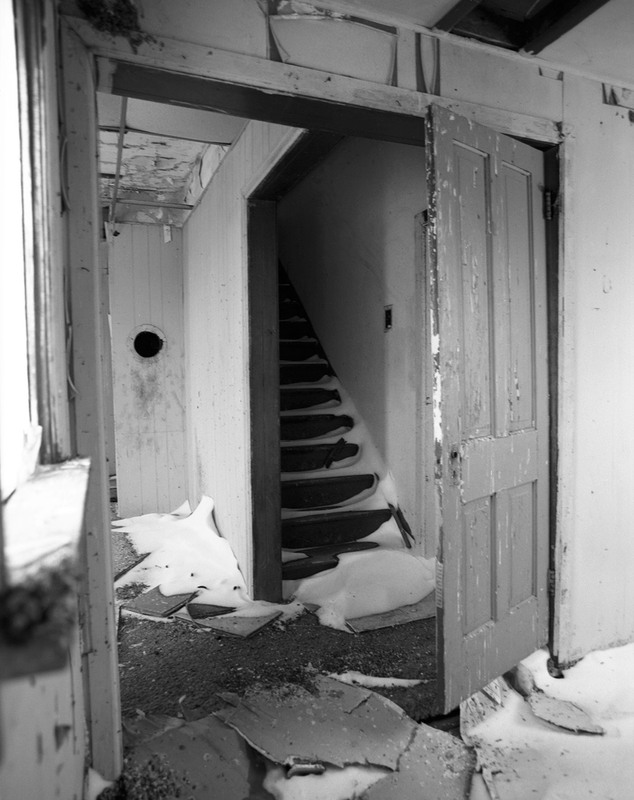 The snow that blew through the night before our trip settled into miniature drifts in the corners and on the stairs inside. The floor was obviously too unstable to stand on, and the light was failing, making an interior shot unlikely. 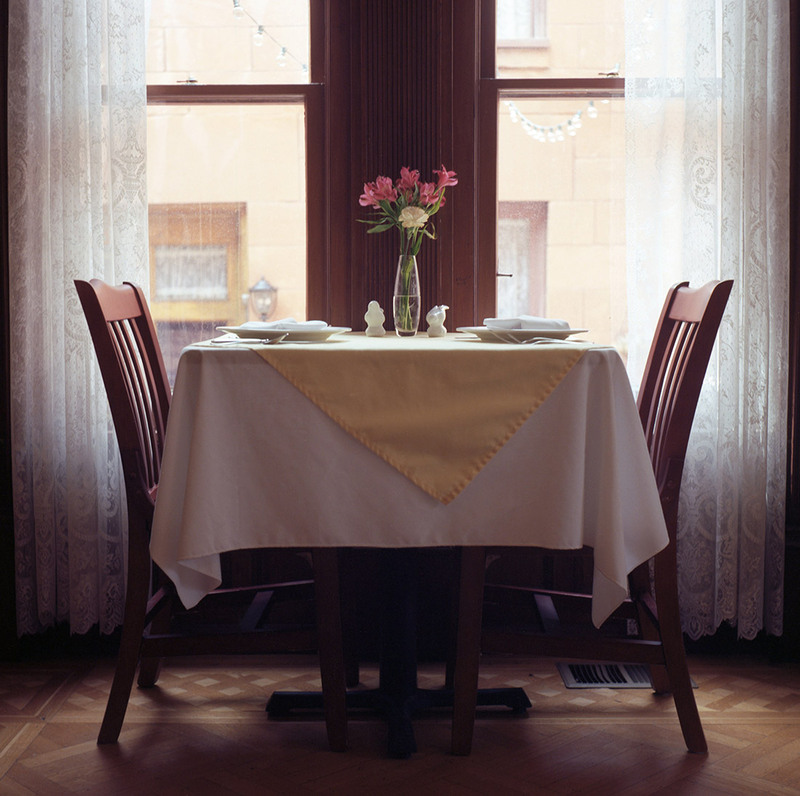 I lucked out, though, by carefully holding the 6×7 against the door frame and making this exposure at f/5.6 and 1/8 second. It’s a miracle, to me, that it’s as sharp as it is. February brought with it the second annual month of redscale photography, BIFscale16. I found some impressively orange tones with this particular roll of film and found the subdued look very appealing, actually. This Castle Rock antique mall has hundreds of items arrayed on its wide veranda, and in the early afternoon the sun left them pleasantly desaturated in the shade. I couldn’t tell you exactly why I like this image so much, but the color and composition both really work for me. I shot four rolls of redscale in February, with three wildly different outcomes. The first was ASA 400 Kodak consumer film, which gave red reds and good contrast. The third was ASA 400 drug store film that was grainy and dim, and mostly unusable. The fourth — fresh ASA 100 Kodak Ektar — was so red my eyes hurt just thinking about it (I still liked it). 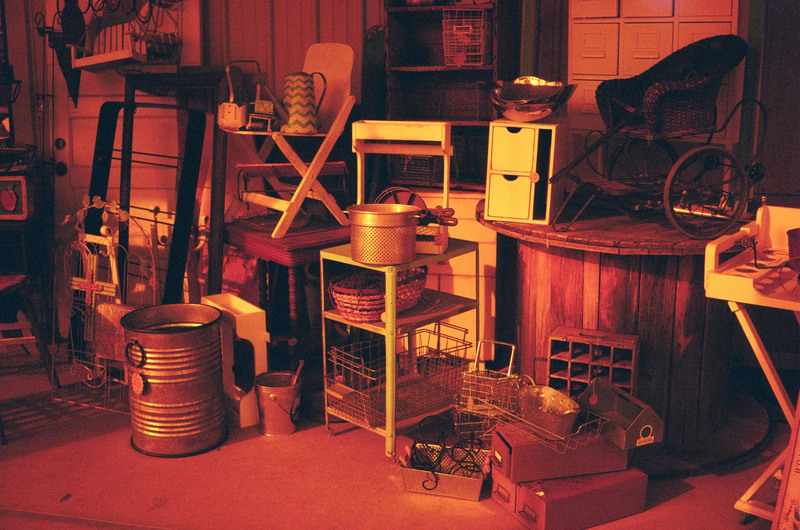 But the second roll — Fuji Superia 400 — was the one that truly won my heart. Not long after that Expired Film Day went from idea to reality. For that day I took a half dozen or so cameras around the north-central Front Range of Colorado –Longmont, Lyons and environs — with a variety of film formats and ages. A few things didn’t work out at all, and others came out great. I never cease to be amazed by the incredible range of results possible with expired film. In preparation for Expired Film Day I was asked to write my first paid freelance article for a photography publication — a deeply-reported primer on expired film for PopPhoto.com. I learned enough to have been contacted a number of times since then by people seeking my advice, and I’m pleased to feel I can offer useful experience to the photographic community. It was on Expired Film Day that I got back the Leica I’d received for Christmas, too. I’d had it fixed and CLA’d in Longmont, Colo., and my destinations on the day were heavily influenced by it being ready for pickup. 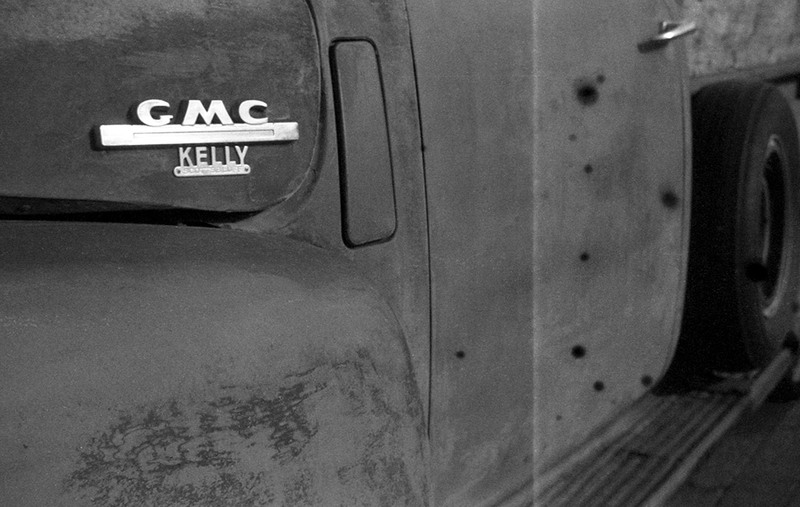 I loaded it with some 20-year-old Kodak Plus-X and made it part of the fun. Shortly after March 15, though, I decided to put some fresh film through it for more thorough testing, and found the above extremely high-contrast scene in Denver. 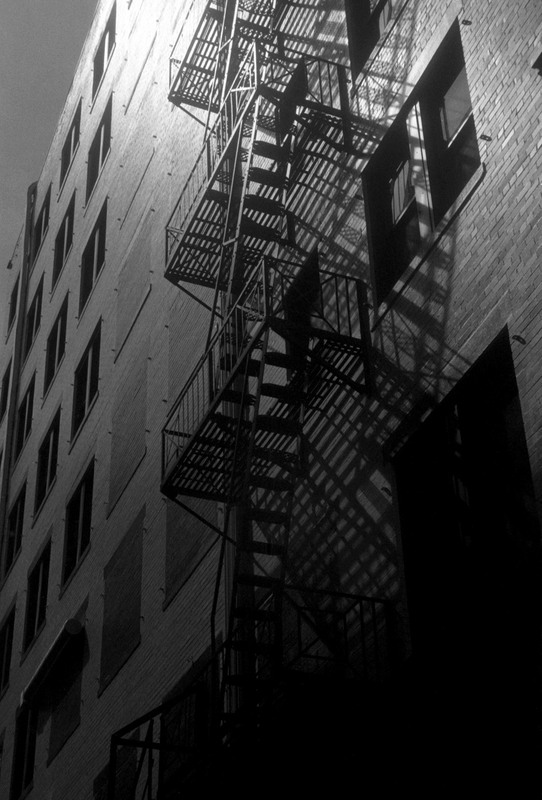 I didn’t know quite how it would come out, but hoped the fire escape’s shadow would lend the image some compelling shadows and lines. Boy did it ever! Also just after Expired Film Day, I happened to catch some St. Patrick’s Day scenes in downtown Denver on a lunch break. I don’t normally involve myself in the revelry on such holidays — no matter what color the beer is — but I enjoy seeing others celebrating — for a few minutes. Early in the day, at least, when only the truly dedicated have had enough time to become noticeably intoxicated. One of the real treats of St. Patty’s in particular, though, is the bagpipes. No, not traditional Irish uilleann pipes — actual, factual Scottish Great Highland bagpipes. I know, I don’t get it either. But who said things have to make sense to be enjoyable? I heard the pipers from nearly a mile away and followed my ears. 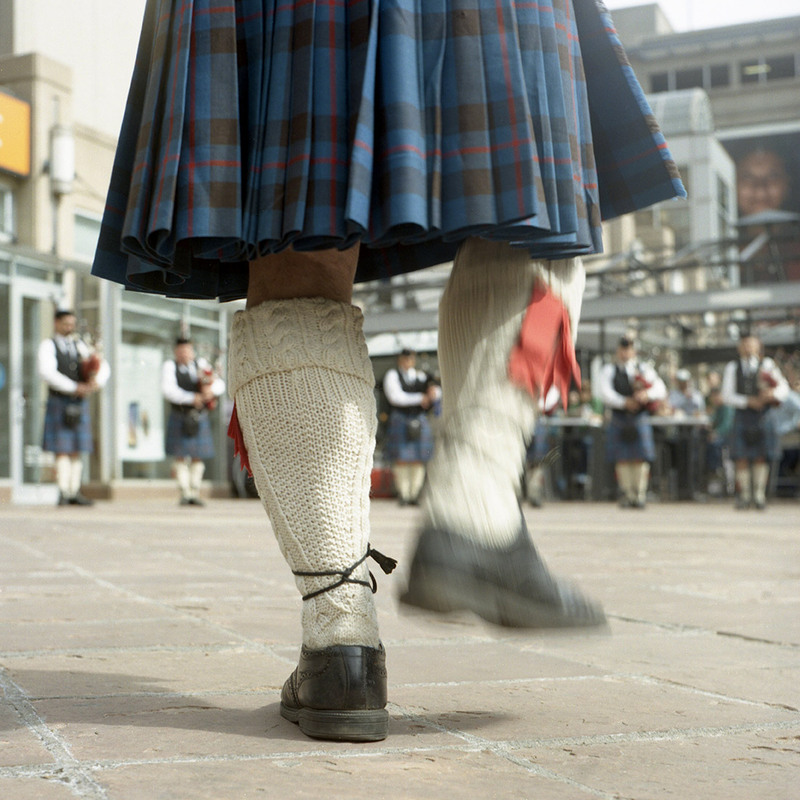 The feet pictured belong to, I believe, a pipe sergeant — the first deputy of a pipe band’s leader, the pipe major. In this case, he stamped the beat during a passage at the beginning of a tune when the drums were silent. The Yashica-Mat was sitting on the bottom rail of a low fence, just a few inches above the ground, when the music began and the sergeant tramped conveniently into the frame. In April I got the chance to tour a number of historic and notable Denver buildings as part of Doors Open Denver for the third year in a row. The Croke-Patterson Mansion in Denver’s Capitol Hill neighborhood (now operated as the Patterson Inn B&B) topped my list for the day. While living in Cap Hill, I’d walked past the impressive facade regularly going hither and thither, though for most of that time it was shuttered. Shortly before I moved farther from the city center restoration work began and, three years later, the Patterson Inn opened for business. 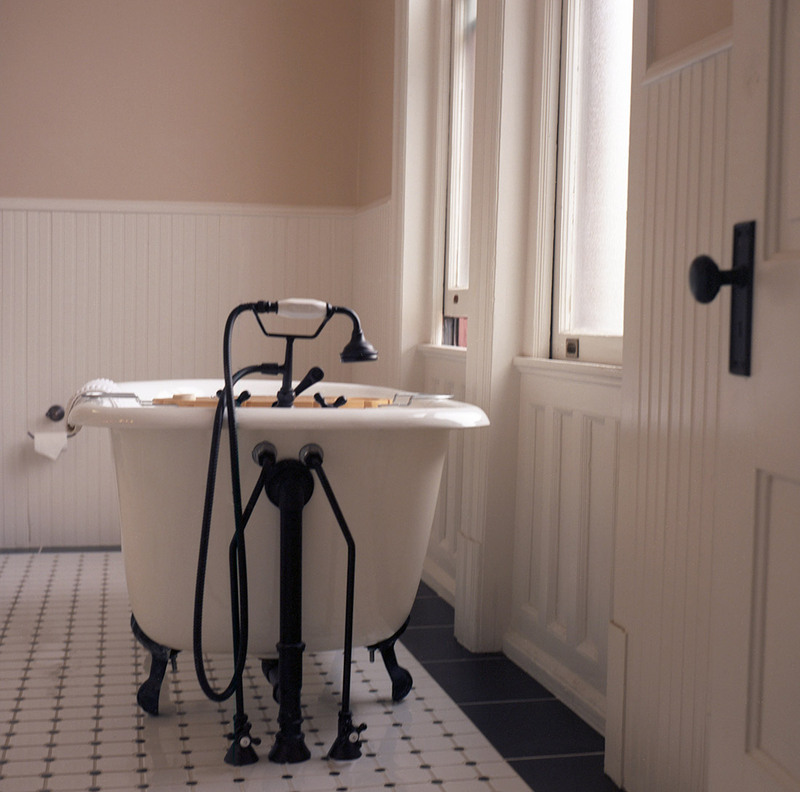 The two guest rooms open for the day were both very impressive, but one of the guest rooms’ bathrooms and the dining room captivated me with their orderly elegance. I could see possible cover images for interior design and decor magazines everywhere I turned. It was the perfect mostly-cloudy kind of day to photograph indoors with natural light, too. And so, two of my favorite photographs from the year were taken within half an hour or so, less than fifty feet apart. Both were made on the same roll of Kodak Ektar in the Yashica-Mat (I’m sensing a trend here…), hand-held at something like 1/15 of a second and probably f/5.6. In the latter half of the year I’ve focused a lot more on cruising through reviews of all the outstanding cameras in my pile. I’m not done quite yet, but I’ve made a lot of progress. I’ve mentioned many times my effort to purge my camera collection of all but the standouts I want to keep long term, but I hope to review each one before I sell, give or donate it. The majority of the pictures I’ve made in this effort have been unremarkable, but a few from a test roll I took with a Pentax Spotmatic — my second — impressed me. 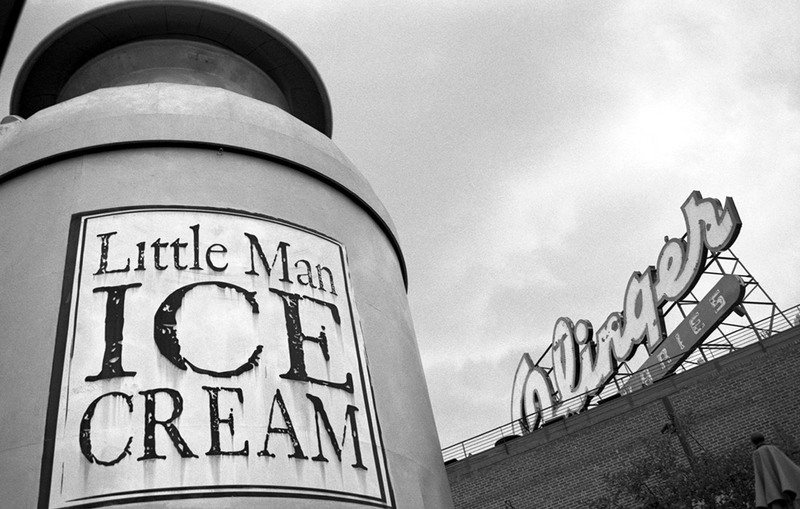 This picture of Little Man Ice Cream — one of Denver’s triumvirate of best ice cream shoppes — was my favorite out of all those test rolls. Tied with Little Man, in my mind, for the city’s best two-scoop vanilla waffle cone with rainbow sprinkles (pretty much the only way I eat ice cream) are Sweet Action and Liks. The last photo of this year’s selection of ten best is a portrait of a regular at the coffee shop where I write much of this blog. Ryan (below) is a young musician working toward his big break, and he agreed to sit for a few photos I plan to use to help demonstrate some ideas I have about portraiture, when I get around to finally posting that story. 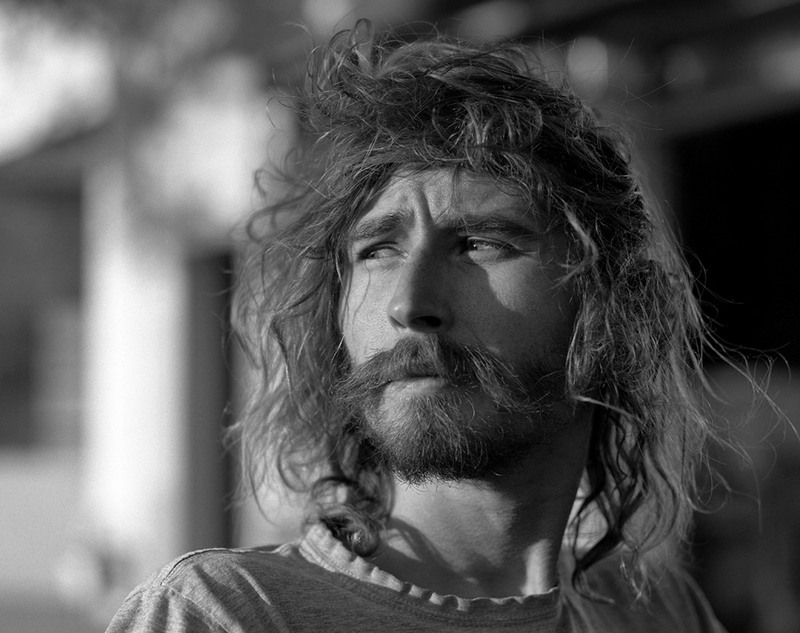 The photo was taken in partly cloudy afternoon sun in front of the café with the Pentax 6×7 and 105mm f/2.4 lens. Well, that puts a cap on 2016. With just a few days left in the year and all my film developed, what remains now is to start printing these photographs. And keep releasing T-shirts in 2017. I hope you’ll drop in and see what I come up with next, or connect with me on Twitter to share what you’re working on.